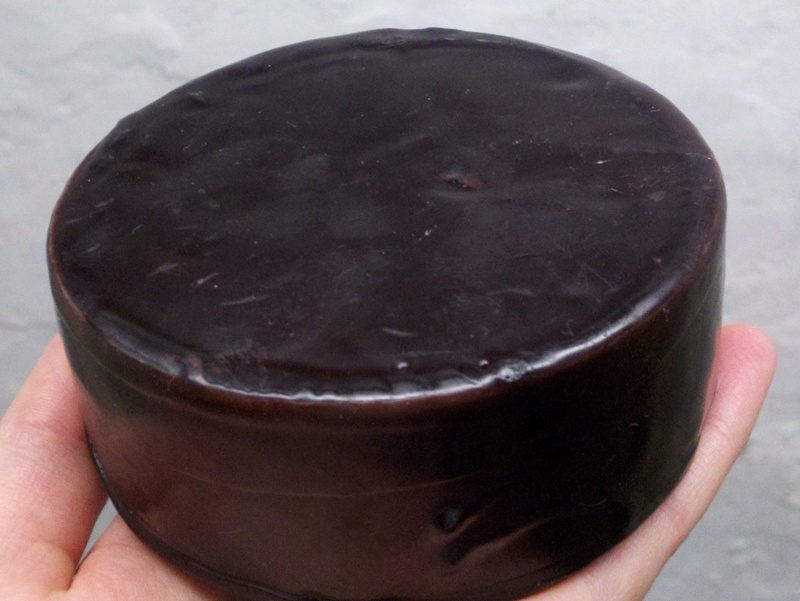 This nice little hockey puck is a wheel of waxed Farmhouse Cheddar that Adam and I made a few weeks ago. The fun wasn’t over when it came out of the press! Adam took this to work for the first week, flipping it over twice a day, monitoring the moisture content, and watching to see when enough of a rind had formed. (This step reminds me of a high school classmate who found a litter of motherless kittens and brought them to school in a shoebox each day so she could bottle-feed them. I’m sure wheels of cheese on your desk is almost as good a conversation starter!) After a few days of this, it was time to wax, then it was my turn to babysit. After two flips a day for another week and checking to make sure there was no suspicious bulging of the wheels, we’ve now moved on to the stage of a few flips a week and the long wait. Farmhouse Cheddar is ready to eat in one month, but we’ve made a few batches of this before, and while it’s good after a month, it only gets better the longer you let it age. I think previous batches made it to the 6-month mark, and tasted great. 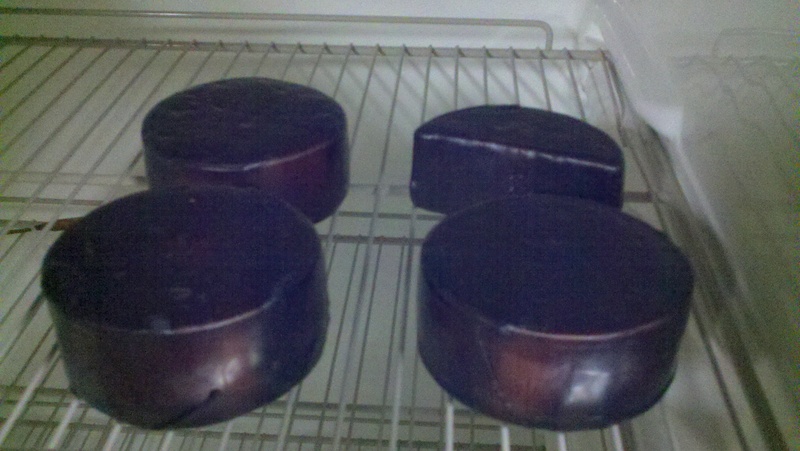 These are the 3.5 cheese wheels in our “cheese refrigerator.” The half-wheel is the result of the daily nibbles that seem to be a requirement in that first week of flipping and monitoring. The fresh cheddar carries a hint of what it will become, and it’s hard to resist, which is why we’ve decided to make mozzarella whenever we make cheddar. It’s quick and easy, relatively, and gives us some immediate gratification while we begin the long wait. This entry was posted in Uncategorized by heycheeseman. Bookmark the permalink.